Six months ago this week, 20 children and 6 adults were killed in a shooting at Sandy Hook Elementary School in Newtown, Connecticut. The tragedy devastated the community and our entire nation. It also brought national attention to the problem of gun violence—which plagues many communities on a daily basis—and galvanized millions of Americans to support common-sense regulations to help reduce this threat. Since that tragic day, 5,091 more people have died from gun violence in America, including 366 children and teenagers. Although Congress has failed to pass any federal legislation in the wake of the Newtown tragedy, a number of states have taken steps to pass laws that make their communities safer. These laws include universal background checks, bans on assault weapons, restrictions on high-capacity magazines, and increased funding to confiscate illegally owned weapons. Faith leaders have played a key role in these state efforts. These leaders see firsthand the effects of gun violence in their communities; they are at the forefront, dealing with the aftermath of this violence by providing support to families and by working in these communities to help reduce violence. Faith leaders are lifting up the voices of those in their communities affected by gun violence, calling for civil and peaceful dialogue and advocating for common-sense violence-prevention measures. Here are six ways in which faith leaders have helped bring about gun-violence prevention laws at the state level. 1. In Connecticut faith leaders from across the state joined faith leaders from Newtown to share stories about the effects that the Sandy Hook shooting had on their congregants and community and to demand legislative action. After the tragic shooting at the elementary school, clergy were some of the first responders, leading services to provide solace and hope for community members and funerals for the victims’ families. In the weeks and months after the tragic day, faith leaders met with legislators to share the victims’ stories and explain the impact of the shooting on the community. They preached sermons, provided public testimony, held rallies, drafted public letters and statements, and spoke publicly across the country about the importance of gun-violence prevention legislation. On Valentine’s Day faith leaders participated in a rally in Connecticut in support of the bipartisan legislation that was a response to the Newtown shooting. In April the state legislature passed a law that requires background checks for all gun purchases, bans the sale of high-capacity magazines, adds more than 100 guns to the state’s list of banned assault weapons, and develops a dangerous-weapon-offender registry. 2. In Colorado faith leaders advocated for legislation requiring universal background checks and a ban on high-capacity magazines, and led efforts calling for civility in the debate. In the wake of the Newtown shooting, Colorado faith leaders organized the state’s first multifaith rally for legislation to prevent gun violence. They were joined by community members affected by the shooting in Aurora and by other acts of gun violence. Together they called upon the state legislature to “let us live.” When the legislative debate unfortunately became polarized and exceedingly negative and the rhetoric turned threatening, faith leaders led efforts to maintain civility despite strongly differing views. “We understand that people have different points of opinion on gun legislation, but we can still be civil and loving towards each other,” said Cleaves Memorial Church C.M.E Pastor Mark Hill, who was joined by other clergy at the state capitol. The event was organized by Together Colorado, a faith organization in the PICO Network. In April exactly eight months after the Aurora movie-theater shooting, Colorado passed two bills, one requiring universal background checks and the other banning high-capacity magazines. 3. In Maryland a broad faith alliance was instrumental in passing the Firearm Safety Act of 2013, which includes a provision requiring fingerprint licensing for gun purchases. Through a rally in Annapolis, a faith demonstration outside a gun shop, a public letter to state legislators, and, most recently, a TV ad praising the law, faith leaders worked alongside the Marylanders to Prevent Gun Violence coalition to support gun-violence prevention legislation introduced after the Newtown shooting. In February the Presbyterian Church USA organized legislative visits to the capitol, but when the fingerprint-licensing provision was in jeopardy of not being included in the larger gun bill, faith leaders took action. The Ecumenical Leaders Group of Maryland sent a letter signed by clergy from around the state to the members of the Senate Judiciary Committee, stressing the importance of this provision in preventing “straw purchases” that result in guns getting in the hands of criminals. “We faith leaders spend much too much time burying fathers, mothers, sisters and brothers killed by gun violence and comforting their stricken families,” the letter read. In addition to finger-print background checks, the law, which will go into effect October 1, created a restriction on high-capacity magazines, a ban on assault weapons, and a safety-training requirement to receive a gun license. 4. In Georgia faith and gun-violence prevention advocates were successful in beating back a bill that would have allowed concealed carry in churches, college campuses, and the courthouse. In a state with some of the least restrictive gun laws in the country, faith leaders were some of the most vocal in their opposition to a law that could bring more danger to their communities. At a press conference of religious leaders at the state capitol, Rabbi Peter Berg said that synagogues and churches are “the last place on earth that people can go to get away from the violence that is so prevalent in our world” and urged legislators to keep them places of refuge. In February Episcopal Bishop Rob Wright opened a session of the Georgia House of Representatives by calling for stronger gun laws. “It is hollow to respond to parents who have lost children to gun violence that their dead child is somehow just the price of keeping the Second Amendment intact,” he said. 5. In Washington state faith leaders filed official paperwork to pursue a ballot initiative requiring criminal background checks for firearm sales. In the absence of political leadership, faith leaders have joined the Washington Alliance for Gun Responsibility to bring the issue to the public. Although the legislature failed to pass universal background checks this session, 8 in 10 Washingtonians support this legislation. Faith leaders now plan to work with their secular partners to gather the 325,000 signatures needed before January 1, 2014, so that the measure can appear on the ballot in November 2014. “Preventing gun violence is not only a political issue; it’s a solemn moral obligation,” said Rev. Paul G. Ryan of St. James Cathedral in Seattle at a faith press conference, where the initiative was announced. Rabbi Daniel Weiner of Temple De Hirsch Sinai believes it is time to take action now. “We will no longer wait as another family grieves the death of a loved one, as another youth is shot down on our streets. We will not wait for another Café Racer, or another Sandy Hook,” he stated. 6. In California Christian and Jewish leaders joined the LIFE Coalition to advocate for increased gun-safety measures in the wake on Newtown. Even in California, which has some of the strongest gun-violence prevention laws, advocates are working to close the loopholes that exist in these regulations. Bend the Arc: a Jewish Alliance for Justice, California Church Impact, Clergy and Laity for Economic Justice, and PICO joined with teachers, medical professionals, and gun-violence prevention experts to advocate for the LIFE Act, which is a package of seven gun-control bills aimed at tightening the state’s regulation of firearms. California Gov. Jerry Brown (D) also signed legislation in May that would provide $24 million in funding to confiscate illegally owned weapons that the police have identified. The LIFE Act, which has already passed the State Senate, is now headed for the State Assembly. While all of these efforts are important, advocates for gun-violence prevention laws know that a patchwork of state laws is not enough to keep our communities safe. Local faith leaders continue to work across denominations and states to call for federal legislation to prevent gun violence. More than 40 national denominations and faith-based organizations have joined together under Faiths United Against Gun Violence to advocate for federal legislation. Various denominations have also created theological and organizational support for their churches across the country in the form of sermon reflections and educational toolkits. In an effort spearheaded by the Religious Action Center for Reform Judaism, more than 20,000 people of faith called Congress in February and April to demand universal background checks and other gun-safety measures. PICO and Faiths United organized more than 400 local events in a Gun Violence Prevention Sabbath in March. 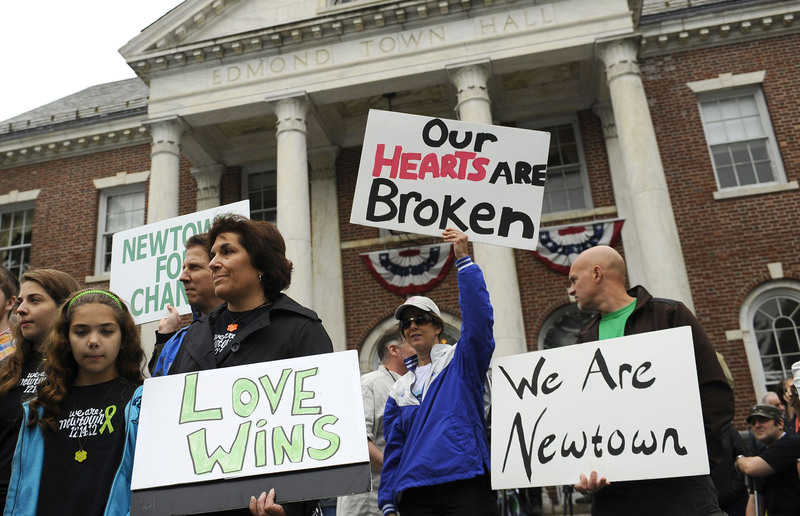 And while advocating for gun legislation in Connecticut, Newtown clergy also called on the U.S. Senate to support stricter gun laws. Inspired by their actions, in March 4,000 religious leaders from across the country signed on to their letter within 72 hours. Finally, on the six-month anniversary of the shooting at Sandy Hook Elementary School, Mayors Against Illegal Guns launched No More Names, a national drive to reduce gun violence. The effort consists of a 100-day bus tour, which will travel to 25 states and partner with local faith groups along the way to bring attention to the victims of gun violence and the devastating impacts on communities. Moved by the shooting at Newtown and the violence that plagues our country on a daily basis, faith communities are standing up to say “enough.” Across the nation and across denominations, these faith communities are doing all that they can to make sure we will not have to mark the anniversaries of any more Newtowns. Eleni Towns is a Research Associate with the Faith and Progressive Policy Initiative at the Center for American Progress. For more on this initiative, please see its project page.